Disclosure: I received the cash register from Learning Resources for review. All opinions are my own. It's the 30th Anniversary for Learning Resources and they have introduced a special edition of their classic cash register. Since my kids love to pretend play, this is a great addition to our home. It is solar powered and comes with real size currency - i.e. dollar bills, coins. This is a great learning tool in teaching children about the values of currently as well as mathematics. Kenzie was excited to see how realistic the different coins were. She sorted them equally as well as the bills into each compartment. She then saw the full size "credit card" and decided it was time to go shopping so that she could check out. What's neat is that you do not need any batteries for the calculator feature to work. Kenzie can learn her basic math skills while having fun. What parent doesn't love that? This is a durable toy as Mason has tried to carry it across the room and dropped it several times. His favorite feature is the open button which he is constantly pushing. The money is realistic and grandma was even fooled by it being left out on the table! 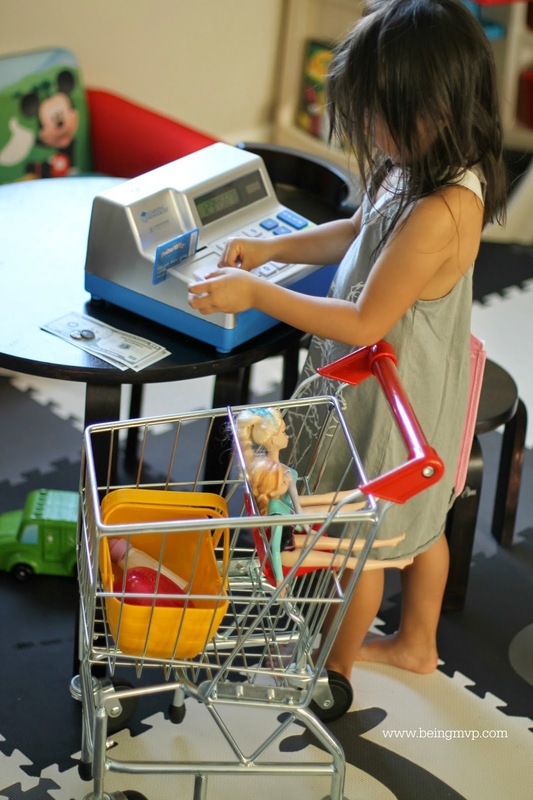 This is by far the best play cash register the kids have played with and Learning Resources has definitely delivered on their anniversary. 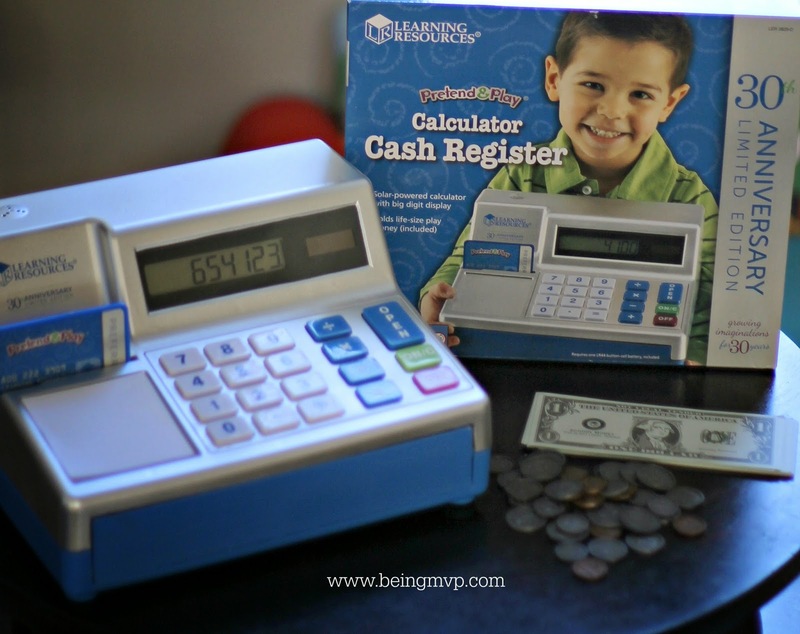 Do you think your child would enjoy playing and learning with the 30th Anniversary Pretend & Play Calculator Cash Register? My son is all about this always making me pretend food and using his bucket as a cash register. I only need $3dollars mommy. I like the look of this cash register it looks more "real" because it doesn't look too colorful or plastic like some others I've seen. My son would love this, he loves to play store. I will have to put this one on the christmas list! 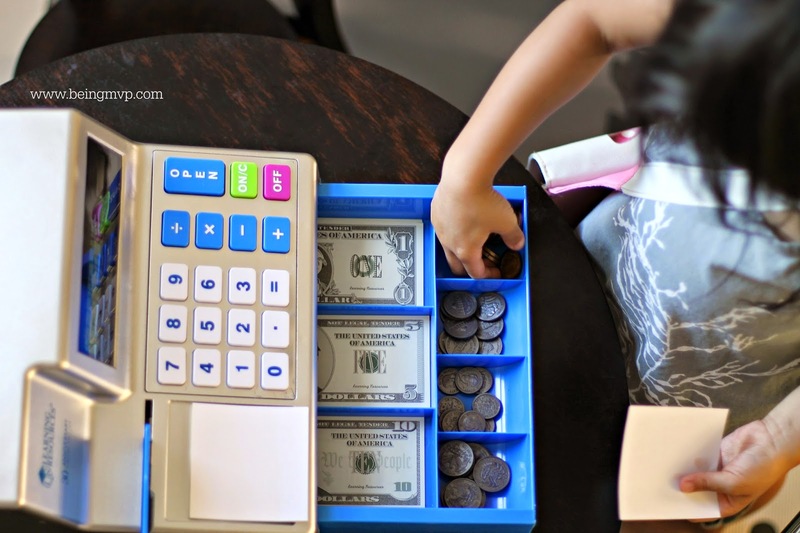 This would be great for my grandsons to play with and learn how to count money at their play store! I love this. My grandson would have lots of fun with this. I could see my 3 youngest enjoying this and the money does look pretty real. These are the best! I think every kids had one to play store! Awesome toy they can have fun with and learn at the same time, great educational toy. Love this! An expansive variety in these gadgets are seen in the market, as there are various number crunchers for everything from a specialized individual to a bookkeeper.